Use this area to Control aspects of your calendar's behavior when a visitor selects search. This area will determine which fields will be available to your calendar visitors when searching for events. 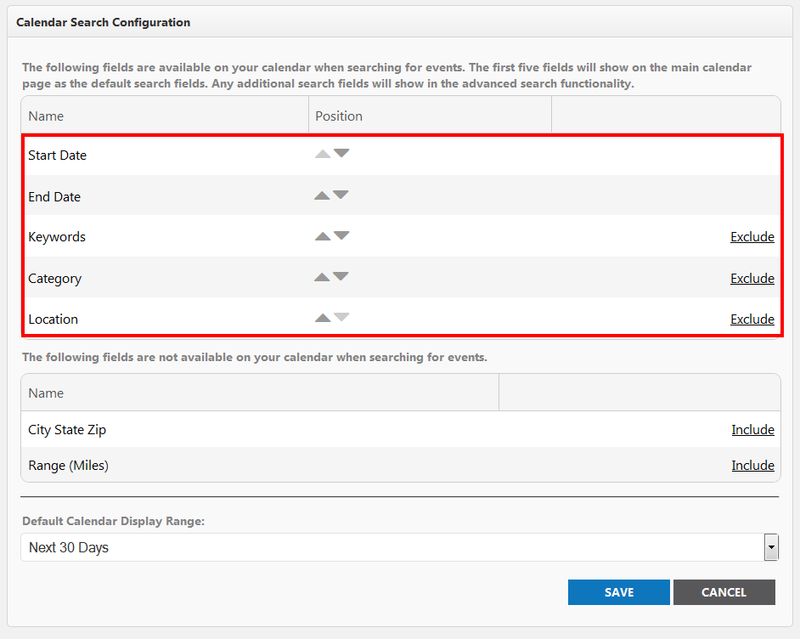 The currently enabled fields that visitors can use when searching for events will be displayed here. They will be arranged in a table containing the Name of the Search Field, the Position of the search field, and a link to disable or remove the search field. Please note: Start Date and End Date are required fields and cannot be removed. The following fields are available on your calendar when searching for events. 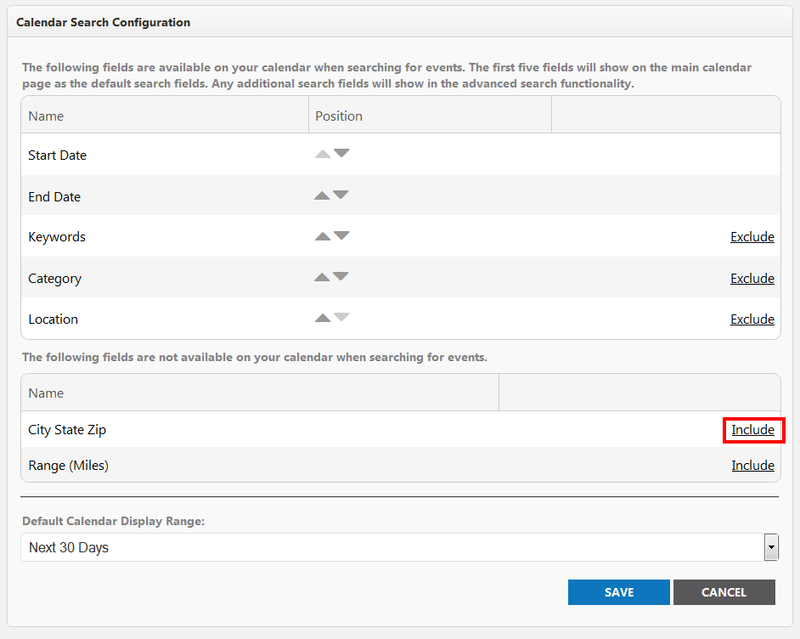 The first five fields will show on the main calendar page as the default search fields. The currently disabled fields that visitors are unable to use when searching for events will be displayed here. They will be arranged in a table containing the Name of the Search Field, the Position of the search field, and a link to enable or include the search field. The following fields will not be used when searching for events. You can click the "Include" link to enable searching for events using these search fields. You can customize the search fields available to your calendar visitors using the "Exclude" and "Include" links on the right side of each search field. Enabling a Search Field: To enable a search field, click the "Include" link to the right of the search field name. Disabling a Search Field: To disable a search field, click the "Exclude" link to the right of the search field name. 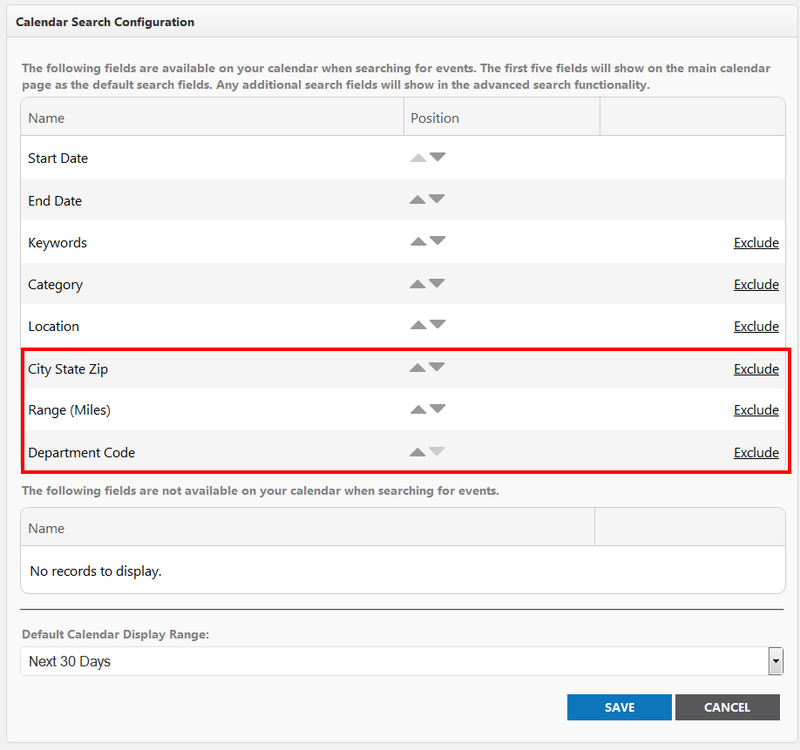 You can customize the order in which search fields are displayed to your calendar visitors using the "Position" arrows to the right side of each search field name. Click the up arrow to have a search field appear sooner. Click the down arrow to have the search field appear later. Any additional search fields, or those that are the sixth item or greater in the list, will show in the advanced search box. Event Publisher will not enable any advanced searching by default. However, you can create additional Search fields in Event Setup, any required multiple choice fields can be used as an advanced search field. The fields outlined in red below will be available via advanced search. The following fields can be used to find events near a specify city, state, or zip. Start Date Filter: This filter allows for the visitor to specify a start date of events to be included in the results. End Date Filter: This filter allows for the visitor to specify an ending date of events to be included in the results. Category Filter: This filter allows for the visitor to specify one or more categories that must be associated to the events included in the results. Location Filter: This filter allows for the visitor to specify one or more Locations that must be associated to the events included in the results. City State Zip When searching for events based on proximity a visitor can enter a City, State, or Zipcode in this field. Please note, proximity searching currently supports United States Locations only. Range (Miles): When searching for events based on proximity a visitor can enter a number in this field. This number will be the number of miles to search for events, relative the value in the Proximity Keyword field. Please note, proximity searching currently supports United States Locations only. 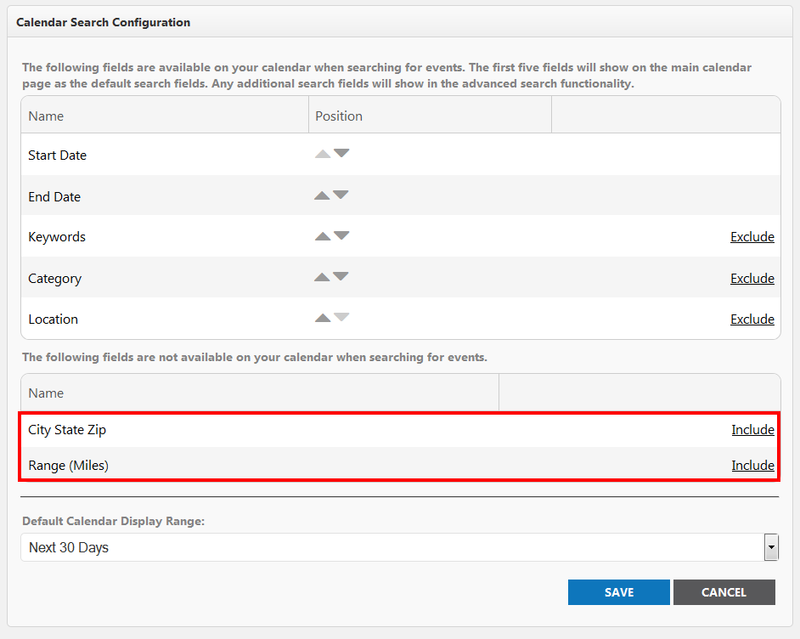 If your site administrator as created Custom Event Fields you can select them as a search filter in this area. Please note Custom Event fields must be required and crated as a multiple choice field in order to be used as an advanced search field. 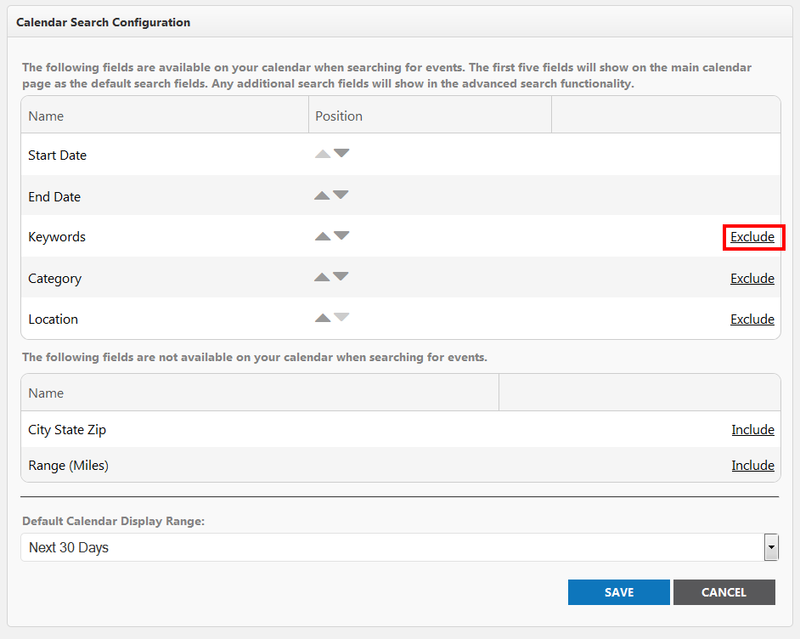 Custom Event fields that can be used as a search filter will be listed in your Disabled Search Fields by Default. Use the "Include" link to the right of the field name to enable or disable the field as a search filter. When a visitor navigates to your Calendar all events for all categories, locations, and search filters will be displayed. By default, the calendar will display the next 30 days of events. When working with Calendar Settings there are two possible actions, theses action are: Save and Cancel. Clicking Save will apply all of the change that you made to filter fields in the list. 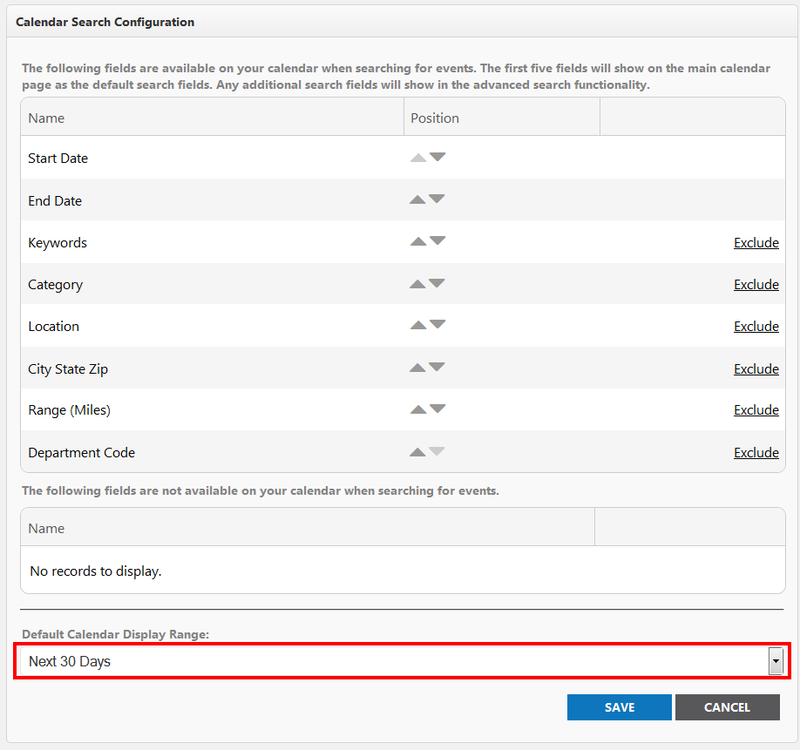 Choosing cancel will discard all changes to the filter fields and return to the calendar's default event listing.